Take a look through our collection of lovely ladies. 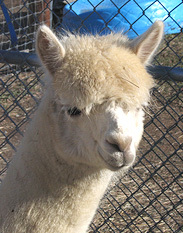 Buffy was the first alpaca to come to Celtic Knot in November of 2005, with her cria Tilly at her side. 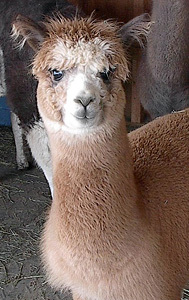 Since then she has produced several female cria that are rapidly becoming the foundation of our herd. 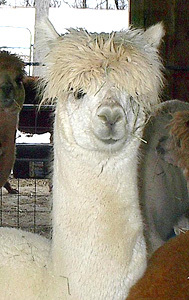 Buffy is often seen leading the herd and even maintained her dominance after we added a guard llama to the pasture. 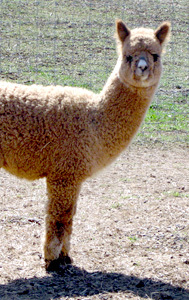 Buffy's fleece is still dense and crimpy even after producing several cria, it spins up beautifully. 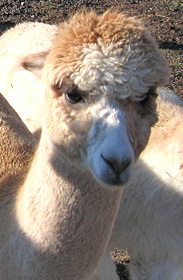 The second production female to join our herd, Maria has produced several cria that now grace our herdsire section. Maria is an independant gal and does things her own way, even if the rest of the herd is following the leader out to pasture and she wants to stay in the shed a little longer to eat all the hay or stay in the shade. Maria's offspring are easily regonized in our herd by distinctive white markings on the face, and legs of fawn bodies whether she is bred to a white or a bay black. Maria's fleece has a nice soft hand and good staple length, making very nice yarn. 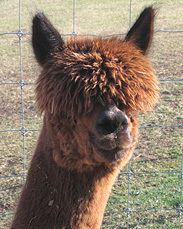 Kiss was introduced to our herd in 2006 to try and expand our genetic bloodlines. Kiss would like to be the leader in the pasture, and would have taken over if Buffy hadn't been in charge from day one and firmly established herself. Open a gate to a new pasture though and Kiss will try and beat Buffy in a race to get through it. 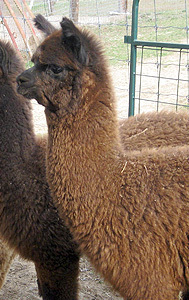 Kiss's rich dark coppery fleece has a more bold crimp than most of our other alpacas. Placed 2nd (out of 7) in the MF/DF Spin-Off at the 2008 MAPACA Jubilee. Placed 3rd (out of 4) in the MF Spin-Off at the 2008 AOBA National Conference. 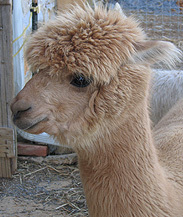 Matilda, or "Tilly" to us, came to Celtic Knot as a cria with her mother Buffy. Since then she has grown and is now adding her own cria to our herd. Each morning she is waiting impatiently for us to put out the grain and hay, and whines emphatically when it is not done fast enough or when someone oversleeps and breakfast is late! When anything new is added to the pasture Tilly always has to investigate it thoroughly. Tilly may be white, but has the potential to throw color. 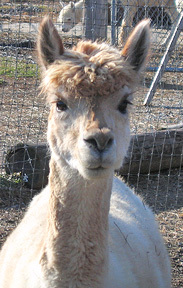 Godiva was the first cria born at Celtic Knot. 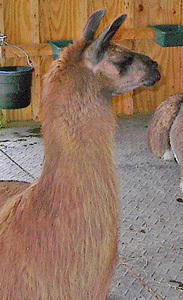 Her mother, Buffy, came to us bred to CPeruvian Accoyo Express 0222. We were delighted when she was born, but her dark brown color came as quite a shock since her mother is dark fawn, her father is light fawn and her half sister is white as snow. We have come to realize that no matter how sure you are of what color the next cria is going to be you must always be ready for surprises. 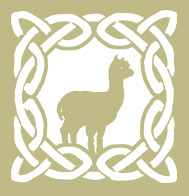 Godiva's rich brown fleece is sure to appear often in apparel made at Celtic Knot. 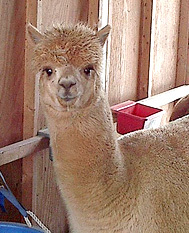 Placed 4th (out of 6) in Halter Class 116 at the 2008 PAOBA Breeder's Showcase. Angel is a great little female who joined our herd as we began to expand our numbers. She is a great mother and gave us a beautiful little fawn male out of our herdsire Montero, and a true black female out of our herdsire Merlin. Angel's fleece has very nice crimp, with good staple length. 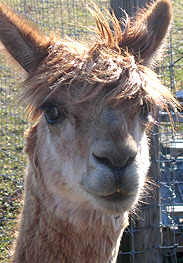 Izzy was born on the farm to our main female Buffy and our herdsire Montero. She is a beautiful, inquisitive girl and the spitting image of her half sister Tilly. Lynette is as inquisitive as her mother Tilly and sister Izzy, and as strong and active as her father Monty. She has nice conformation and great potential in her fleece. At a distance she appears close to white, but has vague fawn streak down her back. Her good size and shape bode well for her future in our herd or yours. 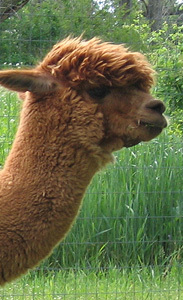 Placed 5th (out of 5) in Halter Class at the 2010 PAOBA Breeder's Showcase. Morgan is a striking animal with her rich brown coat ans black points. She is very laid back and easy to handle. Being Kiss's first cria, and sired by ELK Triple Crown, she will be an asset to help diversify our herd or put some great genetics into yours. Elaine is out of our female Maria and the herdsire Dracula's Mario. She is a small female like her mother, and has very nice fiber. Placed 6th (out of 6) in Halter Class at the 2010 MAPACA Juliblee. Guinevere is a beautiful little female out of our girl Buffy bred to Berry Meadow Excalibur. 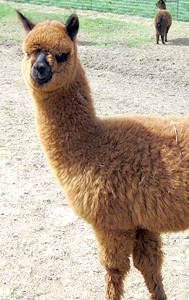 She is a friendly alpaca with great fiber and confirmation. Placed 5th (out of 8) in Halter Class at the 2010 PAOBA Breeder's Showcase. Cloudy was added to our herd to bring in black fiber, which up until now we were lacking on our color palette. Anna took us a little by surprise, though with her sire RV Jeronimo being a bay black, we shouldn't have been. Anna has almost the same look as her mother, Lady Godiva, only in black instead of brown, but before the end she may be a silver grey, as with every passing month more and more white seems to appear in her fiber. Anu, similar to her almost sister Anna, took us completely by surprise as both mom, Earth Angel, and sire, Merlin are medium fawn. Anu is all black except for the tips of her ears which are white. 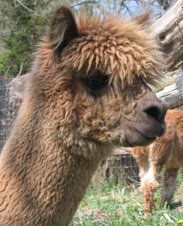 These alpacas are available for stud. Contact us if you'd like to get one of your females together with one of our males for a drink. "One Shot Monty" as we like to call him, has settled every one of our females on the first try, much to his dismay. Spit happens all too soon for him in the weeks to follow. Monty is a very large and dominate male, weighing in at over 250lbs of muscle, even with his size he is still easy to manage during breeding and spit-off sessions. He just can't be left unattended anytime there are open females on the other side of 4ft fencing without sturdy posts and a secure top board. Guess how we know that? 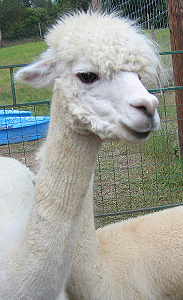 Though Monty appears white, he has a small fawn spot on his neck and has produced everything from white to dark. 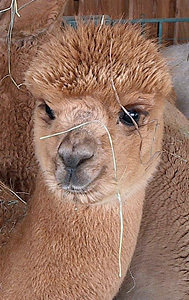 Merlin was the second cria born on the farm and is one of the friendliest alpacas we have. 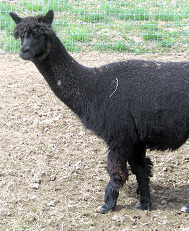 He is a product of our Maria who came to us bred to RV Jeronimo, a bay black. 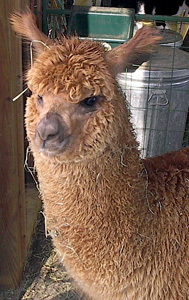 As of yet Merlin has no cria on the ground, but he is anxious to remedy the problem. 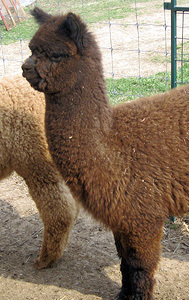 Tristan was the second cria born to our Maria and is out of Dracula's Mario, a white. 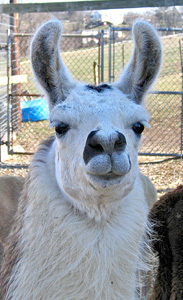 Like his half brother Merlin, Tristan has white markings on his face and front feet. He also has a small gray spot on one hind leg. Tristan needs time to mature before his breeding years, but he is showing great promise with the quality of his fleece and great confirmation. Percy is a large strong boy, just like his sire Monty. He has great confirmation and consistent fiber. Gareth was born just before his mother Cloudy came to our farm. He was sired by R.A.Hercules of D.L., a white. 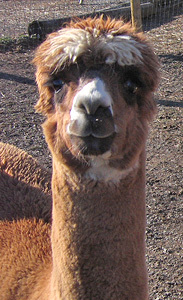 Gareth is a small friendly alpaca that always wants to see what you are doing. Gawain is yet another offspring of our Maria, holding her color with a white face despite the fact that his sire is Cloverleaf's Earle Grey. Gawain is super friendly, even letting people pet him on his top knot. Lionel is our first male out of our female Secret Kiss bred to Cloverleaf's Kindred Spirit. His blanket is solid brown, but his ears and nose are black. Lionel has a high spirit, but is still relatively friendly. These cute little guys and gals are the babies of the bunch. New Cria are on the Way! But for now, please be patient. You can't rush Mother Nature, after all. All the geldings on the farm. Eee Aye Eee Aye Oh. Racero is the only Suri on the farm. He was added to the herd in the farm's first year to help bolster numbers to make the first arrivals feels more comfortable. He has since settled in as "uncle" to the junior herdsires keeping the yearlings in line. Better known as Teddy, this gelding came to Celtic Knot in 2006 with our herdsire Montero. Even though Teddy's legs are a little short and he holds the title of oldest alpaca on the farm, nothing stops him from being the first to the feed pan at meal time. Not even Montero, who is a good 50lbs heavier and close to a foot taller than him, can beat him out. 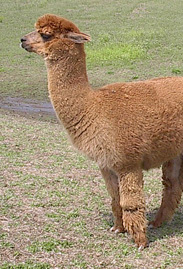 Every Alpaca needs a big strong buddy. These guys keep our herd safe and sound. Scarlet is the proud majestic sentinel watching over our pastures. As our senior guard llama she is ever vigilant and protective of our playful cria she keeps an eye out for predators that may be in the area looking for an easy meal. While she is not the easiest animal to work with, weighing far more than either of us (and she knows it), it is a settling thought that she is always in the pasture looking after the herd, since we need to get some sleep sometime. 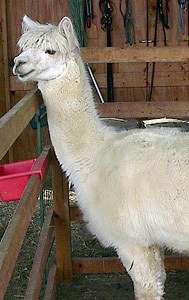 Sadi breaks all the rules we have ever known about llamas. She rushes to the gate to greet you, she wants to be petted and if you don't she comes right up and puts her face in yours to get your attention. 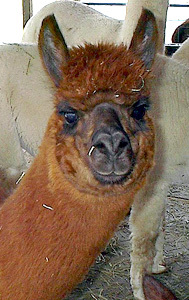 She has never spit on anyone that we know of, and is just the most lovable llama we have ever encountered. We hope to eventually have her looking after our juvenile females when we set up a weaning pasture to separate the maidens from our production females.